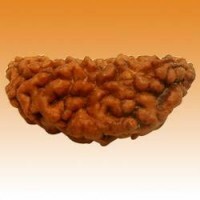 Rudraksha, also rudraksh, Sanskrit: rudrākṣa ("Rudra's eyes"), is a large evergreen broad-leaved tree whose seed is traditionally used for prayer beads in Hinduism. The seed is borne by several species of Elaeocarpus, with E. ganitrus being the principal species used in the making of a bead chain or mala. Rudraksha is a Sanskrit compound consisting of the name Rudra ("Shiva") and akṣha ("eyes"). The specific epithet ganitrus is possibly taken from ganitri, the name for this species in Sundanese and Malay. Rudraksha grows in the area from the Gangetic plain in the foothills of the Himalayas to South-East Asia, Nepal, Indonesia, New Guinea to Australia, Guam, and Hawaii. Rudraksha seeds are covered by an outer shell of blue colour when fully ripe, and for this reason are also known as blueberry beads. The blue colour is derived not from pigment but is structural. It is an evergreen tree that grows quickly. The rudraksha tree starts bearing fruit in three to four years. As the tree matures, the roots buttress rising up narrowly near the trunk and radiating out along the surface of the ground.